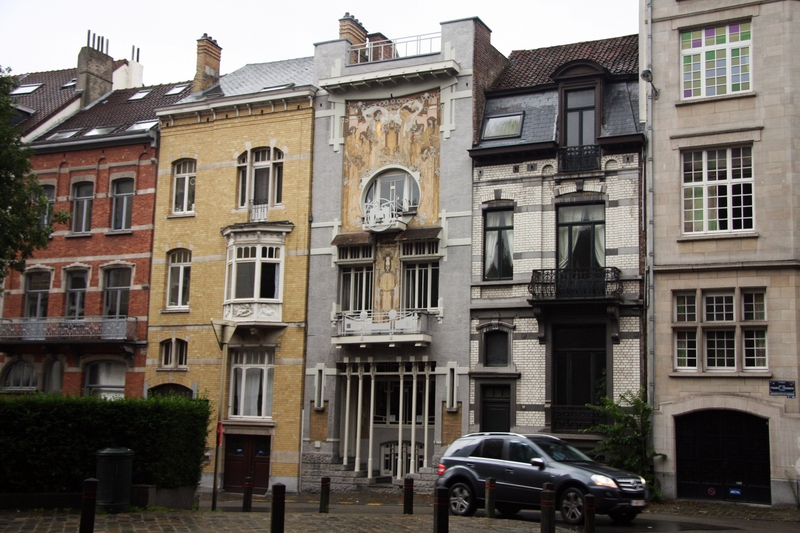 Today, I am sharing with you the photos of the Maison Cauchie, a beautiful Belgian house entirely designed by Paul Cauchie and his wife Lina that was built in 1905 in Brussels, next to the Cinquantenaire Park. 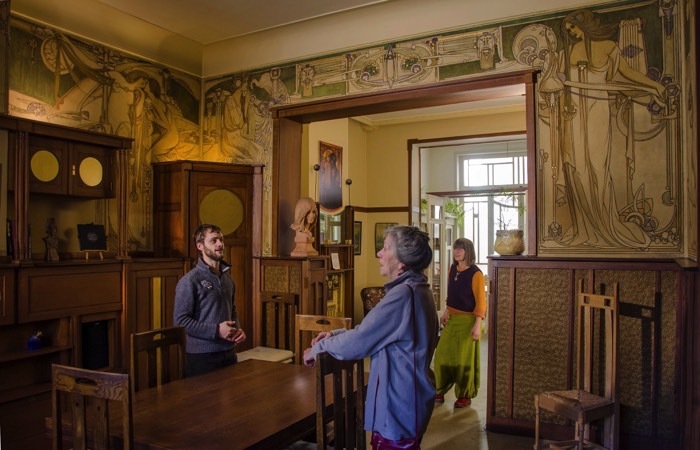 Its style is Art Nouveau, not to be confounded with Art Deco, as I did at first, which is a reemergence of Art Nouveau after WWI. Both Paul and his wife were interior designers and although they intended to live permanently in the house, they actually meant for the house to be an advertisement of their work. I love this building because it literally is a celebration of the couple’s love for each other. On the facade, you can read on a beautiful sgraffito ‘Par Nous – Pour Nous’ (‘By Us – For Us’) as Paul and Lina designed and worked on their home together, right after their wedding. There are more allusions to love in the sgraffiti that ornate the front room. 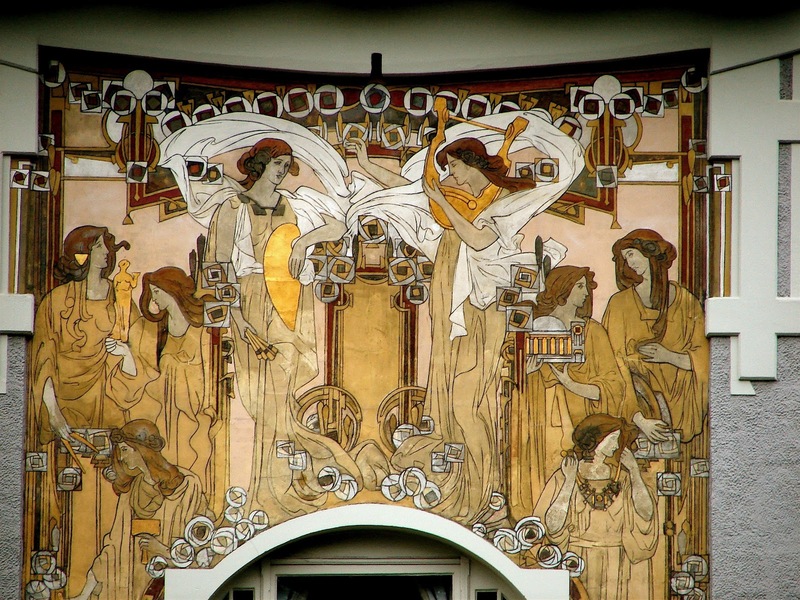 Symbolism played a great part in the Art Nouveau movement so that’s not a surprise Cauchie used it heavily inside out. When Paul dies in 1952, his widow and daughter decide to redecorate the interior of the house that seemed dated at the time. Luckily they don’t destroy any of the plaster work which will later be restored to its original beauty. After her mother’s death, Suzanne, the couple’s daughter, plans to sell the house for it to be destructed but fortunately it was saved just in time when the building got listed. Neglected, the house fell into disrepair and was later found by an art lover couple who bought it in the 80’s and started the laborious restoration process. Only the ground floor is accessible to the public as the first and second floors are rented to private tenants. 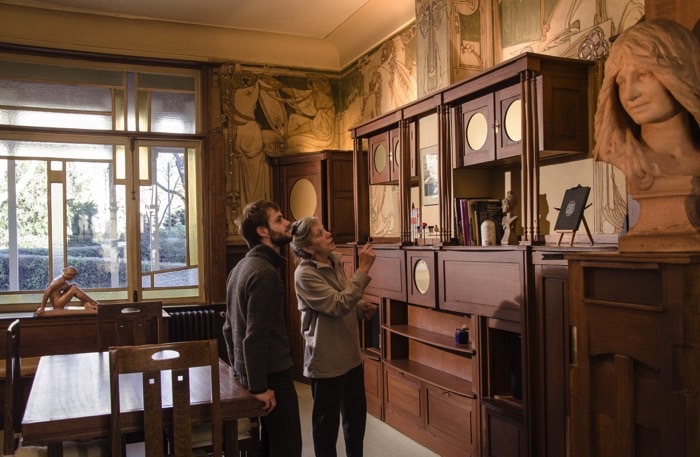 The original furniture that we can see in the front room was found intact upstairs and was designed and built by Cauchie in the Mackintosh style to fit the front room perfectly. It is absolutely breathtaking to stand in that room that looks frozen in time, really. Visiting it in person, I was blown away by all the symbolic and the lovely history behind this marvelous house. I felt it needed to be shared. Sources: one, two, three, four and five.